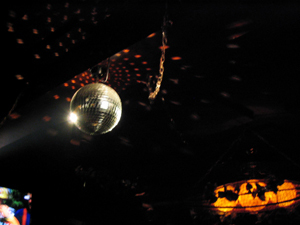 ou're paralyzed by the swirling disco ball. It disorients you; fast moving circles of light fly by on the walls, smoke-filled shafts of light pierce your eyes in the snug dimness. Lots of warm, carved wood, fierce faces of idols on the walls and strange glowing Polynesian dirigibles that hang in the spangled upper reaches counterbalance the swill-like Budweiser pints you're downing. Sink back into the enveloping comfort of your huge padded banquette. Gather your chi. Your turn is coming. 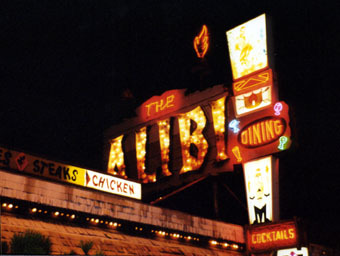 The Alibi on North Interstate Avenue: it doesn't get better. If you enjoy your karaoke it really doesn't get better than The Alibi on North Interstate Avenue. The atmosphere is like a crazy South Pacific womb, the drinks are strong, the KJs are nice, and everyone is a star for five minutes  usually four times a night! Currently, young singer Windy is doing the heel-toe rocking motion as she hits us with her best shot, Pat Benetar's "Hit Me With Your Best Shot." Not bad; and any kind of movement is a big plus for the adoring crowds. You like to assess the room before you pick your songs. If it looks like a strong crowd, you play to your strengths. The right "timeless classic" can ignite a room, even while boring the KJs to tears. This looks like one of those nights. Among the dozen or so guests, a birthday party has majority rule. There is always a birthday party doing karaoke at The Alibi. The birthday party is always good natured, enthusiastic and predominantly trashed. That is, the birthday parties were totally trashed in your day (mid-'90s) when you often accompanied your half-mad-with-romantic-desperation friend Styve on daily and weekly karaoke binges. Mostly at The Alibi. Mostly trashed, too. And it worked. Styve found a girl, got married and had a baby, largely because of his unearthly versions of Bee Gees, Journey and Toto. But nowadays singers are no longer getting so drunk that they go vomit between songs, or simply do it at the table. Ah, those were the days. Now, only the Birthday Girl, Mag, appears capable of going off the deep end. If only to keep you covertly amused. You're not carded when you order, even though you've just shaved and look about 16. Common Alibi wisdom holds that no one under 21 would be weird or destitute enough to go do karaoke alone on a Wednesday night. It's a ball: the notes are almost hit. Lack of OLCC troubles aside, Mira now camps up Barry Manilow's "Copacabana" like Amanda Lear (who, coincidentally, has a version of the song out) and gets a nice karaoke gimmie with the lyric "Like in Havana, have a banana." The bonus laugh is unneeded, as this group is strictly singing with and for itself  more like their own small Japanese karaoke room, which groups of friends rent by the hour for a private night of fun. Leaving the kitschy, well-dressed 20-something fantasy world for the even more exotic and cozy bar area, you get some cash. In the glowing poker machine/ATM nook, people talk of parole. Interstate Avenue is where one group crashes on another group's shore, and vice versa. Soon, two other parties arrive, separately; a couple and a lone man, both current regulars, as, it seems, is the Birthday Girl, who is flailing around bellowing Marky Mark. You pick old songs ("Tin Man," "Let 'Em In," "Never My Love," etc.) that KJ Steve says he hasn't heard in a long time (probably the last time you sang them). And that is your triumph  you haven't bored the KJ. 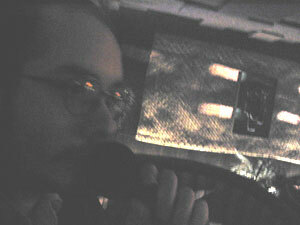 Noeh boldly strides to the microphone; you're hoping he's going to rip it because he's doing "Rio," by Duran Duran. Though affable, he's actually a quite mild performer, hewing close to the microphone while occasionally succumbing to the curse only the best singers avoid. It's that tight-throat feeling of constricted vocal cords. Because few people know their own registers and no one remembers exactly how high the melody goes until they're right at that note. Your neck muscles go for a death-grip on the trachea, and your note just flattens right out, strangled like a wilting daisy. It's a slow night, and soon the kids stop taping themselves with cell phone cameras while they sing and drift out. Maybe your trenchant version of Jackson Browne's "Somebody's Baby" drove the apparently single Birthday Girl home. Or just the fact that few others were here. A good crowd foments the flames. On the other hand, slow nights mean you get to sing all you want, no matter how pathetic. Now just KJ Denise and her brother-in-law are here, so your ill-advised performance of Bowie's "Young Americans" shuts the place down. What's your alibi: the author makes the scene. The lights are out in back. The notes are almost hit. For good or bad, the karaoke surge in Portland is over; many years over. But as long as there are people who just want to sing a song or two after a long day, as long as there are drunken girls having birthdays, as long as there are cozy caves of dim light and fuzzy dreams like The Alibi, you can sing. Most names have been altered by one vowel to mask the reputations of the supposed innocent.